DIFFERENT PRICES FOR 2/4 GUESTS. Warm, cosy north Norfolk country cottage for up to 4 guests only 4 miles from the sea at CROMER, full of character. Beechwood Cottage stands off a quiet country lane with stunning sunsets and uninterrupted countryside views. The beamed kitchen is well equipped and the beamed lounge and snug with inglenook and woodburner effect stove is cosy and relaxing. The sun room with door to south facing patio overlooks the garden. PLEASE NOTE: DIFFERENT RATES FOR 2 AND 4 GUESTS. SEE WEB SITE. Prices quoted on calendar are for using 1 bedroom. FRIDAY CHANGEOVER except for short breaks - short breaks have a set price, not worked out daily. Beechwood cottage has a warm homely atmosphere with PURE WATER straight to your taps. It has been decorated and furnished to retain its unique cottage appeal. Beams, original cottage stairs, some low doorways, inglenook fireplace with woodburner effect stove all combine with central heating & moderm equipment to create an ideal cottage atmosphere. The pretty double bedroom and large shower room have lovely views over unspoilt countryside & stunning sunsets. Guests can enjoy boat trips to the Seal and Tern colonies at Blakeney and walks through Holt Country Park. The Weavers Way walk, just over the fields, takes you across Thwaite common, with many different species of birds and wild flowers, and on to the spectacular 17th c. Blickling Hall - surrounded by acres of National Trust land. The cottage stands off a truly rural quiet countryside lane with far reaching field views and stunning sunsets. Enjoy the pure water which comes straight to your taps from our adjoining cottage bore (regularly tested). 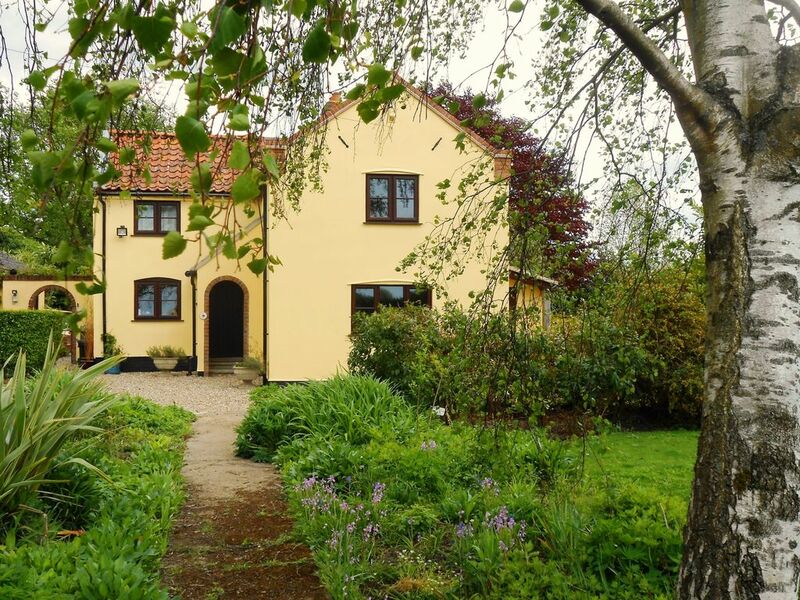 A lovely relaxing character cottage so near to all north Norfolk's main attractions. PRICES QUOTED ARE FOR 2 PEOPLE. SEE ---.beechwoodcottages.--.--FOR PRICES FOR 4 PEOPLE OR USING 2 BEDROOMS. Bright character shower room with good quality fittings & large shower. Field views. Bed, bathroom & kitchen linen provided. Key to use of tumble dryer in outbuilding. Inglenook in snug with wood burner effect fire. Plus a beamed snug with inglenook, books and extra TV. Welcome basket with wine, milk, chocolates, biscuits and flowers on arrival. Beamed kitchen with modern equipment, integrated washer & fridge, ironing facilities. Use of tumble dryer. Private garden with seating on Patio. Bikes not provided but locked storage available for your own bikes. PURE WATER SUPPLY STRAIGHT TO YOUR TAPS from our adjoining cottage bore. Regularly tested so no need to bring bottled water. Sitting room, cosy snug & sun room. This is a charming cottage set in a very quiet location but still only 15-20 mins by car from Cromer. The cottage is well equipped and an excellent base from which to explore the North Norfolk coast. The owner, Enid, could not have been more helpful. We thoroughly enjoyed our long weekend here and hope to come back again next year. Hello. Thank you very much for your review and I'm pleased you found the cottage so peaceful. Would very much welcome you again next year. Kind regards Enid. The cottage was just beautiful with so much character. It felt so calm & relaxed as it's so tucked away. We all went away to have some chilled family time & we all came home feeling refreshed. Everything you need is in the cottage & Enid's extra touches make it even nicer. It really is a hidden gem & i can't recommend it enough. Gosh Rachel thank you SO much. I'm really pleased you had a good time and it was lovely to have you at the cottage. Enid. Loved it . Everything we needed . Warm and cosy . Enid is lovely , hope to return . Karen I'd also like to thank you for leaving the cottage so clean & tidy after your break - very much appreciated. It was so nice to meet you both and good luck for the future. The cottage is cute and cosy with everything you need, and we had a great break exploring the North Norfolk coast. Many thanks! Lovely two bedroomed cottage in peaceful location. Stayed here for Easter weekend had a lovely friendly welcome from the owner,cottage had everything for a perfect stay.Two pubs / restaurant within a 30 minute walk and only a short drive to the coast. Would definitely stay again. Thank you and I'm so pleased you had a good holiday. It was very nice to meet you and you would be welcome any time in the future. ...für Ausflüge in die Umgebung. Enid empfing uns nett in ihrem liebevoll eingerichteten Haus. Wir fanden alles vor, was man für einen entspannten Urlaub in Norwich braucht. Das Haus bietet einen guten Ausgangspunkt für Ausflüge ans Meer und zu netten kleinen Orten. Anregungen dazu bot uns Enid durch Informationsmaterial. Aber auch vom Haus aus kann man wunderbar durch die herrliche Natur spazieren. Thank you - I'm pleased you had a good time and liked the cottage. Lovely waymarked walks - The Weaver's Way takes you to Blickling Hall, the 'Jewel in the Crown' of National Trust properties. Norfolk Broads, Coast (4 miles) & Historic City of Norwich all within easy driving distance. Boat trips from Blakeney & many areas for bird watching. Narrow gauge railways & quaint market towns. Other Activities: National Trust properties. Narrow gague railways. PLEASE NOTE PRICES SHOWN ARE FOR 2 PEOPLE USING 1 BEDROOM. SEE WEB SITE FOR 3/4 PEOPLE: beechwoodcottages.co.uk 3 night breaks £240. 4 nights £270 (excl July/Aug/Christmas) for 2 people using 1 bedroom. 3 night breaks £270. 4 nights £300. (excl July/Aug & pub hols) for 3 or 4 people using 2 bedrooms Flexible starting days Prices all inclusive of electricity, linen, heating & towels Christmas & New Year £460 for 2 people. £630 for 4 people: flexible dates Prices include central heating, electricity, linen & towels.